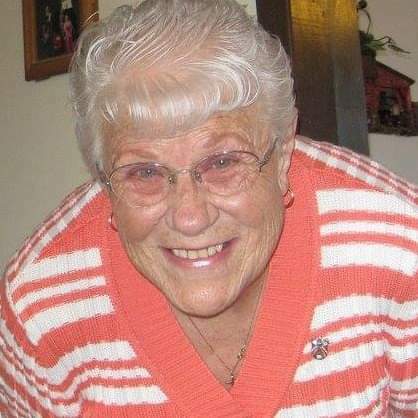 Claudine M. Coker, age 83, of Sharon Springs passed away Monday, April 15, 2019 at the Wallace County Community Care Center in Sharon Springs. Claudine was born June 3, 1935 to Claude DeCliffton and Freda Marie (Walker) Wertz at home in Wallace County. She grew up and went to school in Sharon Springs. On September 15, 1951 she married Glenn Coker at the Sharon Springs Methodist Church. Claudine worked as a CNA, CMA and Activities Director at the Goodland Regional Medical Center in Goodland,and Prairie Manor in Sharon Springs. She was a member of the VFW Auxiliary, Bowling League and Dart League. She enjoyed playing cards, Yahtzee, dancing, cooking and most of all spending time with her family. Preceding her in death are her parents and grandparents; infant daughter, Donna Marie; son, Claude Edward; great grandson, Michael Wayne Langdell; and her brother, Jack Wertz. She is survived by her sons, Glenn Wayne (Shelly) Coker of Sharon Springs, KS and David Lee (Sherry) Coker of Apache Junction, AZ; brother, Donald (Connie) Wertz of Tulsa, OK; sister Beverly (Richard) Henderson of Sharon Springs, KS; grandchildren, Kimberly Langdell; Wayne Edward Coker; John Coker; Laramie Coker; Wade Harvey; Brandi Osberg, Shyann Coker and Morgan Coker; nephews, Shaun Wertz, Bill, Don and Robert Henderson; nieces, Kimberly Belieri and Tami Laughlin; 24 great-grandchildren and 1 great-great grandchild.